The geologically recent volcanic eruptions attest to the fact that the Galapagos Islands are a place born of fire. In the last 200 years, a remarkable 50 plus eruptions have occurred, some threatening the unique flora and fauna, some creating new land (such as the new pahoehoe lava flow on Santiago Island) that was unseen in Darwin's time. 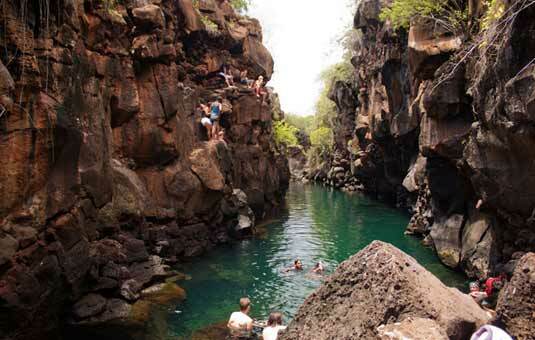 Perhaps Galapagos' most prevalent feature is its harsh and dynamic volcanic landscape. Initially formed between 3 million and 5 million years ago, the islands are "young" in geologic time. Not unlike Hawaii, the islands are located over an area of particularly hot mantle that in essence burns through earth's crust, creating volcanic activity. At these "hot spots," volcanic eruptions pile upon former volcanic eruptions over millennia until the volcanic earth is pushed to the surface of the ocean --forming islands. Generally, the individual islands form from a single shield volcano's eruptions of basaltic lava flows expanding its shores. However, the largest island, Isabela, is made up of six volcanoes which have flowed into each other, filling the Pacific gap between them. Formed by this combination of dynamic volcanic activity and the effects of rain and the continual force of the vast Pacific at their coasts, the islands attest to their origin. The quarter-moon shape of Genovesa and the sunken core across the bay from Pinnacle Rock at Bartholomew testify to these islands born of fire and tempered by saltwater. These forces created the setting for the trials of evolution to select the uncanny animals and flora that now inhabit these desolate isles. Most Galapagos visitors have come from around the world to see the unfearful wildlife or to dive in the crystal blue Galapagos waters. Some have come to follow in the footsteps of famed naturalist Charles Darwin, who visited Galapagos in 1835. Everyone knows the privileged place of the Galapagos Islands in Natural History, but not as many know that the geology of the islands is as fascinating as the wildlife! The story of how the Galapagos Islands were born is an important part of understanding them today. Volcanoes, lava and geology are fundamental to understanding the uniqueness of Galapagos. Most people know that the inside of the Earth is made of magma, or molten rock, and that it's very, very hot in there. So why don't we get burned? Because Earth's upper crust is cool and protects us from the heat. But the crust is not one big solid piece, like the coating on a candy M&M. Rather, the crust is in the form several different pieces, called "plates," that move around and occasionally crash into one another. Where two plates collide, something must give and one plate must necessarily go below and the other above. The plate that is pushed up makes mountains. The plate that has been pushed down begins to turn to magma in the hot center of the Earth and volcanic activity increases. This is why mountain ranges are often home to volcanic activity. A good example is western South America: two plates collide there, forming not only the mighty Andes Mountains but also the many massive volcanoes that are common from Columbia to Chile. The volcanoes in Galapagos are different, however. The Galapagos Islands sit on what is called the Nazca Plate, one of many that form the Earth's crust. In the middle of the Pacific Ocean, the Nazca plate is not colliding with any other. So why the volcanoes? Galapagos volcanoes are created by a "hot spot." A hot spot is a place where the magma in the Earth is hotter than usual. As the Nazca plate drags itself across the hot spot, the extra heat melts the crust, causing volcanoes, which appear seemingly out of nowhere like pimples on a teenager's face. These volcanoes then erupt, forming islands like the Galapagos. Hawaii is another island chain formed by a "hot spot." The Galapagos hot spot is stable relative to the crust and the Nazca Plate moves from west to east across it. Therefore, the Islands that are furthest to the west (such as Isabela and Fernandina) were created most recently, and islands in the eastern part of the archipelago (such as Española) are the oldest. Fernandina and Isabela are still over the hot spot and still the site of frequent volcanic activity: Fernandina's La Cumbre Volcano last erupted in April, 2009! You don't have to be lucky enough to be visiting Galapagos when an eruption is taking place in order to appreciate the volcanic geological history, however. Visitor sites such as Punta Espinosa on Fernandina have many lava fields, where visitors can walk on formations of lava that has cooled. Guides like to point out the different forms that cooling lava takes. The volcanic legacy of the islands is also evident in the many lava tubes present on different islands. 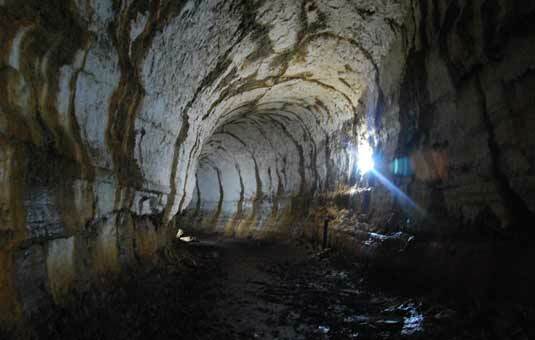 These are underground tunnels that once channeled lava from deep in the earth. Now, many of these tunnels can be explored: they're very interesting, like caves. The ones most often visited are on Santa Cruz Island, a short trip from Puerto Ayora. Volcanic activity continues to play an important role in Galapagos geology. The April 2009 eruption on Fernandina, for example, doubtless killed many Galapagos plants and animals that were unfortunate enough to be nearby. However, the lava has already cooled, forming a new part of the island which can be colonized by hearty pioneer species. This rugged new land is an opportunity for Galapagos species to continue adapting as they have done for millennia!